Balinese cuisine is known for a very spicy taste. It can even cause stomach pain for people who are not accustomed to eating. Such as foreign tourists from Europe and America who are not accustomed to eating spicy foods. But for the Balinese, the food they eat, if not noticeably spicy, it will not feel good. Balinese seasoning made ​​from a variety of local spices. Mixing spices for seasoning Balinese, reaching up to 15 types of spices used. Many spices that are used to make food taste delicious. The concept is used in the manufacture of this spice is, diversity if combined would be more beautiful. When Janet De Neefe travelled to Bali 26 years ago she fell in love – not only with a man, but also with the island's fascinating culture, warm people and mouth-watering food. 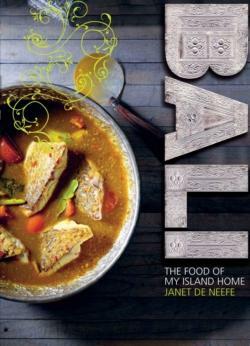 Since then, Janet has been collecting Balinese recipes, teaching local cooking methods and heralding the delights of this colourful cuisine, and in this book she shares all that she has learned. Follow Janet on a spice trail through Bali and its rich food culture, with chapters exploring sambals, rice dishes, curries and coconut, street food, ceremonial food, modern offerings and sweets. Each recipe is accompanied by an insight into the local culture, while key Balinese ingredients – such as kencur, candlenuts and shrimp paste – are explained in an extensive glossary. The recipes will surprise and inspire: there are well-known dishes such as Gado Gado and Chicken Satay, while more unusual offerings include Pork Spare Ribs with Tomato Sambal, Minced Prawns and Coconut in Banana Leaves, and Black Rice and Tangerine Tart. But Bali is more than just a cookbook – it is also an incredible photographic journey. Arresting images sit alongside the recipes and tell the story of this lush island and its people: men collecting sea water and leaving it to evaporate on volcanic sands in order to harvest salt; grandmothers making huge rounds of fresh tofu in backyard sheds; teenagers lining up at bustling market stalls for delicious sticks of chicken satay; street vendors crouched over their grills, fanning away the billowing smoke. Melbourne-born Janet De Neefe first travelled to Bali in 1974 with her family. She returned 10 years later, fell in love with a local man and decided to make this island her home. She has founded two restaurants in Ubud, Casa Luna and Indus, as well as the Casa Luna Cooking School, which attracts hundreds of visitors each year, all eager to absorb the secrets behind Bali's spicy and fragrant cuisine. De Neefe also founded the annual Ubud Writers & Readers Festival. She still lives in Ubud with her husband and their four children. Bali is her second book.